The 2012/2013 season is officially over with the close of the World Team Trophy. When the new season starts in October, the world will be watching. And people might actually care about figure skating in anticipation for the Sochi Olympics. So judges, you might actually need to give Chan marks he deserves next season. In any case, I thought it would be fun to do a state of the union/pre-season predictions post and see how totally slippery the ice is and how my predictions will be. 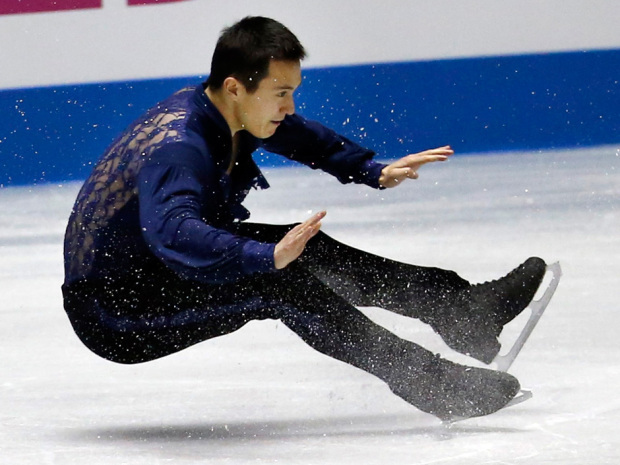 Patrick Chan may get unusually high marks but the unfortunate fact is that when he skates clean, he does deserve those high scores. Whether he makes you feel anything other than patriotism (if you’re Canadian) is another matter. With Javier still establishing himself, Yuzuru still struggling with his LP and with Daisuke struggling in general, there aren’t very many people who can come between Chan and the gold at Sochi right now. Chan’s GP scores will show whether the judges are bringing him back down to the ground during the Olympic season or if they’ll continue with Chanflation. We’ll be keeping an eye out for that. A few factors come into play in this prediction. If Yuna Kim decides to actually participate this season (and I really think she should compete the entire season this time), her decisive victory at Worlds this year proves that she’s still easily a head above the pack. If Yuna doesn’t manage to skate two clean programs or if she doesn’t compete, Carolina Kostner seems to be next in line for the crown. Mao is not at her best these days and despite the JFSA’s insistence to put her above the rest, Akiko Suzuki has shown that she is capable of outskating Mao. Sadly, I’ll just have to cling onto the tiny impossible glimmer of hope that Akiko could win a medal of any colour. As for Mao, I’ve got a feeling she’ll have to feel the bitter bile of disappointment again. I think without a doubt, Tatiana Volosozhar & Maxim Trankov will come out on top. They have the skills (although not necessarily the best choreography) and the right nationality. Mother Russia will get her pairs gold medal back. Or there will be blood. 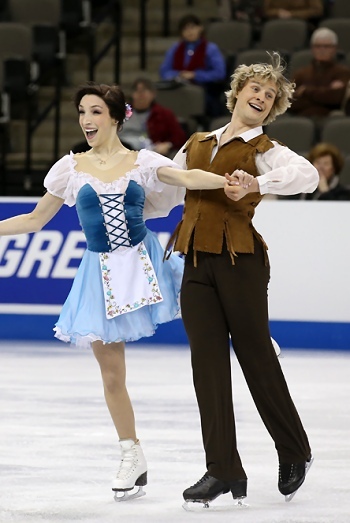 Meryl Davis & Charlie White are still embroiled in a bitter rivalry with Tessa Virtue & Scott Moir, however this season, they’ve proven that they have the upper edge. While Tessa and Scott have been having issues with speed and power, Meryl and Charlie have soared ahead. Knowing Tessa and Scott, they will work hard in the off season to get back up to par and beat their rivals but for now, Davis & White are slightly ahead in the race for the gold in Sochi. Who do you think will be the Olympic champions next year? John Kerr tweeted this video of Patrick Chan doing a 4T-3T-3Lp. If he can do that, a 3A and the rest of his program without imploding or falling is another question. While watching the World Team Trophy, I noticed that Gabrielle Daleman reminded me a lot of Julie Powers from the Scott Pilgrim movie. After a little google work, it turns out that the actress who plays bitchy (and hilarious) Julie is named Aubrey Plaza. She also occasionally appears on collegehumor videos. It’s time for the last event of the figure skating season – the World Team Trophy! Unfortunately, the roster seems a little watered down for a few teams but onwards with the predictions! Here is the roster in a nice table courtesy of wikipedia. Overall, the competition is a little watered down with the absence of the top ice-dance teams and a few of the top Japanese skaters. The roster for this event could be a lot more exciting and I’m actually surprised that Team China (and not Italy) is on this list. Team Canada has a semi-decent roster. Some clear frontrunners within their respective disciplines here are Patrick Chan, Duhamel & Radford and Katelyn Osmond. In order for this to have a strong finish, Kevin Reynolds will have to pull out performances as seen in 4CC. Weaver & Poje should finish a respectable 4th just because of the intense competition of A-/B-list skaters here. Still, I’d love to see another performance of their revamped FD. For once, Team China’s strength will not be in the pairs competition but in singles – namely Han Yan and Zijun Li. This is a good chance for these youngin’s to develop their presence at international competitions since there’s really no chance in hell this team is going to win. Or rank anything but last for that matter. Other than the men and Pechalat & Bourzat, France’s roster is a little weak. Even weaker if Joubert manages to violate the zayak rule again. I may also cry if I have to watch Florent pause for the 10th time in his LP again. Other than the men, Team Russia has a pretty decent roster of competitors. I’ve got a good feeling that they’ll win both the dance and pairs event. If both young diva ladies can hold it together and produce good results, Team Russia might be able to pull off a win at this competition. For their sake, they’ll have to pray that the men can produce some half decent results as well. The U.S. has a decent roster – they could medal but this roster is throwing a lot of monkey wrenches and obstacles so prepare for really wrong predictions. Both ladies will probably do well enough and the men – well… let’s hope they’ll be consistent. Bates & Chock should have a top 3 finish here and if the rest of the team manages to perform as well as they have in the past, they can win the gold. Unfortunately, ice is slippery and you never know what will happen. One thing to look out for in this competition: after Gracie Gold’s decent result from Worlds, the USFSA might try to catapult her to the Olympic podium if she has what it takes to medal here. The U.S. has 3 spots for the ladies at the Olympics and we all know that the USFSA is obsessed with getting a new ladies champion considering their history. I’m not sure if Gold has what it takes *now* to get to the elite level that Yuna, Carolina and Mao are in but she’ll be an interesting contender to watch for the next season. All in all, these will be difficult predictions just because each team is weak in certain areas and no team has a completely solid roster. Many of the results will fall on the shoulders of skaters who haven’t been consistent all season and it’s going to be hard to decide whether or not they’ll implode for the purpose of these predictions. So the lesson is… be prepared for predictions that can be very, very wrong. Ok. Team Russia and Team France changed their ice dance roster which throws things off completely. Predictions re-do. 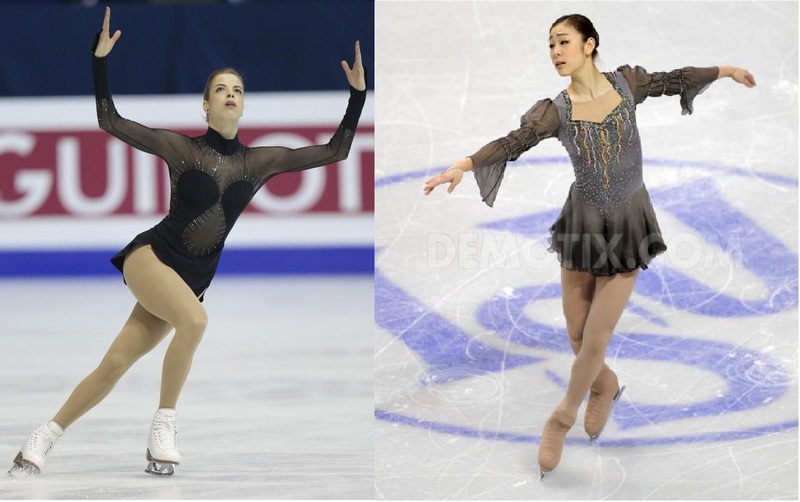 She may not have the same hair colour, but after watching her compete at Worlds, I had thought that Ekaterina Riazanova did have some sort of resemblance to Amanda Seyfried.